What was the reason for the emergence of the instrument value assessment and how did it develop? How was a value assessment research carried out, and to what result? How was a value assessment used in developing and reviewing a conservation plan for a monument, and to what result? What does the design of a value assessment research and the use of a value assessment in the past teach us on how this can be done in the future for the benefit of built heritage conservation? How can a value assessment meet the issues raised in the current practice of built heritage conservation? The structure of this thesis reflects the purpose of the research to come to a better understanding of the emergence, development and practical application of a value assessment, in order to make recommendations for a design of a value assessment research and deployment of a value assessment that meets the current assignments in the practice of built heritage conservation. Part I - The emergence and development of value assessment Part I of this thesis focuses on the emergence and development of value assessment and on the sorts of value assessment research this produced. 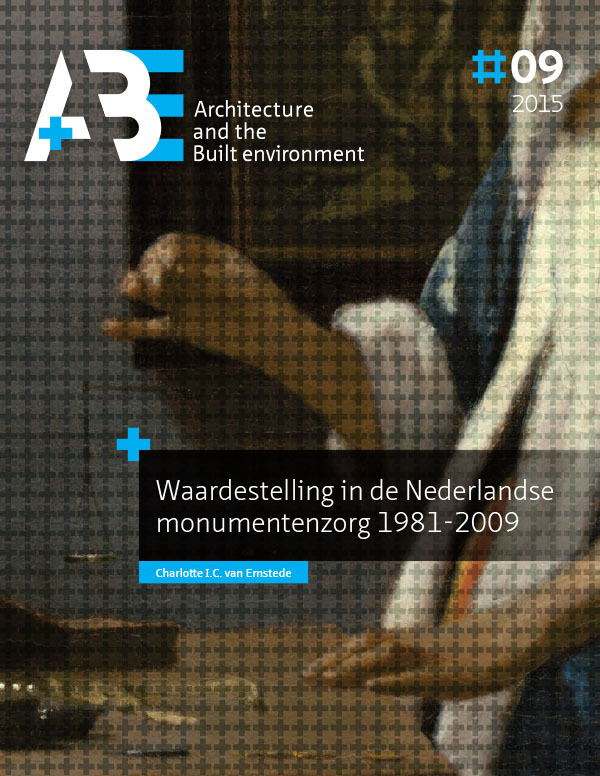 Chapter 1 deals with the recent history of value assessment of monuments, in the period 1981-2009. This is done by analyzing the discourse regarding value assessment and how this was conducted within institutionalized conservation, in theoretical writings, policy documents, and in guidelines and regulations for research and preservation of monuments. Chapter 2 deals with the design and application of value assessment in other fields of cultural heritage, such as archaeology and art restoration. This chapter also looks at possible points of departure the design and use of value assessing research in art restoration offers for value assessment for the benefit of built heritage conservation. Part II - The application of value assessment in conservation practice, 1981-2009 Part II of this thesis contains the multiple case study and covers the chapters 3 to 7. Using five cases from the period 1981-2009, this part examines how a value assessment is used in the processes of developing and executing conservation plans for different types of monuments. The cases are: the adaptive re-use of the Grote of Onze-Lieve-Vrouwekerk in Veere (1989-2005), the rebuilding of castle Nederhemert in Nederhemert South (1991-2005), the renovation and restoration of the Justus van Effen complex in Rotterdam (1983-1989; 2001-2012), the restoration and the adaptive re-use of the Van Nelle factory in Rotterdam (1981-1994; 1995-2005) and the redevelopment of the Oude Rijkswerf Willemsoord in Den Helder (1992-2004). The five cases illustrate the historical development of value assessment research. In addition, they clarify how value assessment research was carried out, the value assessments this led to, how the value assessment was used in the development and reviewing of a conservation plan for the monument and to what end result. Part III - The design of a value assessment research and the deployment of a value assessment in the current conservation practice Part III of this thesis covers the chapters 8 to 11. This section is devoted to the further determination of the requirements, with regard to content and procedural embedding, a value assessment needs to meet. Chapter 8 provides a reflection on the multiple case study. This section provides further insight into how a value assessment can be complemented so that it meets the needs and wishes of the current conservation practice. In that chapter we once again looked at the design and application of value assessment in art restoration, because this approach offers clues to how value assessment of built heritage could be customized. The approach that is common in the art restoration, cannot simply be transferred to the conservation practice of built heritage. Therefore, chapters 9 and 10 respectively go into the requirements, with regard to the content and procedural embedding of a value assessment, that specifically arise from the design and review processes for built heritage conservation. The final chapter of this thesis, chapter 11, presents the conclusions of this thesis. It presents recommendations that may contribute to a higher efficiency and better embedding of value assessment and it preceding research in the conservation of monuments. This final chapter also presents a model for a customized manner of value assessment. The main conclusion of this research is that it is important that, beside information on the various historical values, a value assessment also provides information on architectural, spatial and social aspects of a building or site. It is also important that the named values be related to material and physical aspects of a building or site. In this way, a value assessment can be used effectively in the processes of developing and reviewing a conservation plan. In order to meet these information needs, it is crucial that, besides building archaeological, architectural historical and / or cultural historical research, also an architectural and cultural analysis may be undertaken as part of the value assessment research. This doctoral research has shown that such a multidisciplinary value assessment research for built heritage can, to a large extent, follow the procedure for value assessment research in art restoration. This research presents new knowledge about the history of value assessment and its design and practical use within the Dutch practice of built heritage conservation. In line with its conclusions, this research advocates the approach of heritage conservation as an assignment in which next to the art historical and cultural historical heritage values of a building, an equally important role is reserved for its social and technical aspects and its aesthetic and architectural qualities. This study therefore emphatically supports a multidisciplinary approach to the conservation of built heritage. This study also shows how aforementioned additional aspects can be incorporated into a value assessment research, so that the resulting value assessment can be used more effectively in the conservation of monuments.